Dear Readers, I spent the early part of this week in Dorset, visiting my dad. As regular readers will know, he has vascular dementia, and is living in a nursing home in Dorchester. His face breaks into a huge smile when I walk into the lounge, although I am convinced that he doesn’t know exactly who I am. Still, when I give him the Polo mints and Dairy Milk chocolate that I’ve bought he gathers them up with glee. Sometimes, I think that we are like Russian dolls, with all our previous selves hidden inside us. When I look at his face, I can see the cheeky schoolboy that I never knew. However, Dad is, in his head, a bit older than a schoolboy. ‘The Captain came in to see us yesterday’, he said, ‘and told us not to worry because we don’t have dress parades here’. It seems that Dad is back on National Service. ‘Did he, Dad?’ I said. This actually has a kernel of truth – the residents have a form of music and movement that some of them enjoy. Dad normally sleeps through it, but seems to have embraced it with gusto this week. ‘This might sound wicked’, he says, ‘But I really miss your Mum’. And I have no doubt that, for a moment, he’s actually thinking about the right person. ‘I miss her too, Dad’, I say. We sit in silence for a minute. Then Dad breaks the silence. ‘That woman over there is a real pain’, he says. And so it goes on. On one level, Dad is well aware that Mum is dead. On another, he’s a young man in his twenties with his life in front of him. You could get whiplash trying to keep up. One minute he’s making me roar with laughter, and thirty seconds later he’s breaking my heart. When I mention, at breakfast in my hotel, that my Dad has dementia, the man at the next table opines that if he gets dementia, he’d like someone to ‘take him out and shoot him’. I do wish that people would think before they implied that my father would be better off dead. Dad has dementia, and isn’t the same as he was, but that says nothing about his quality of life. He still enjoys things. He still laughs. He still ponders and is curious. He isn’t in physical pain, or in mental anguish. I am fairly sure that it is worse for me, watching Dad change, than it is for Dad, who doesn’t remember how he was. He seems to have reached a kind of equanimity, for now. I know that this might change, but I am confident that he wouldn’t want to be shot. I said none of this to the man at the table. But I shall be ready next time someone says something like it, bearing in mind that no one says such a thing to be unkind. I think dementia speaks to our deepest fears of losing ourselves and becoming dependent, and there is a kind of existential terror in such statements. Nonetheless, I think it is also a reflection on how we value ourselves, and one another. A person with dementia is no less lovable, or less valuable, than anyone else. Dementia challenges us be with the person that we care about in their world, to see things through their eyes, and to love them in all their various moods and incarnations. My father is not the same as he was, but I have never loved him more. When I get home, I need something to raise my spirits. What with Mum’s death, Dad’s situation and the prospect of selling the family bungalow looming on the horizon I am exhausted and a little heartsick. 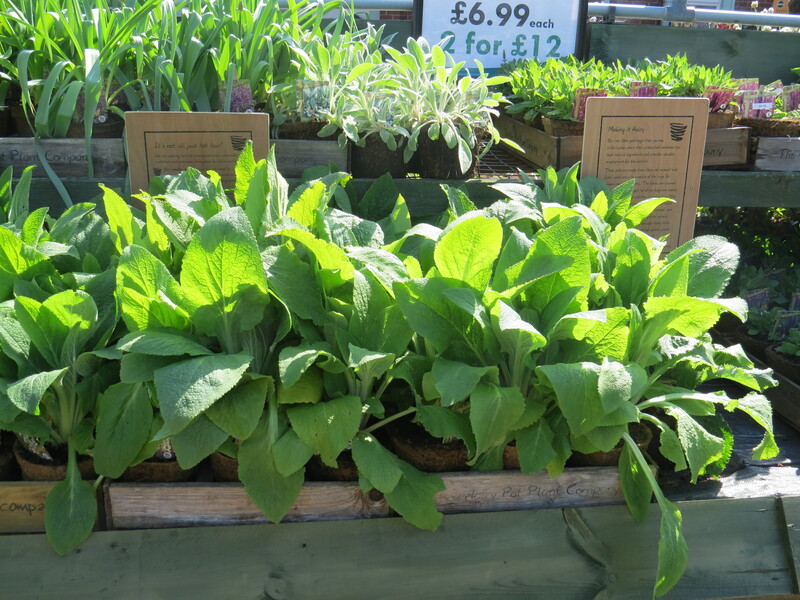 So, my lovely friend J picks me up and takes me to the Sunshine Garden Centre in Bounds Green for some plant therapy. And what an exciting visit it is! The picture at the top of the piece shows a new self-watering system for walls called Wonderwall. If only I had a wall to hang them off of, I would be in business! Each set of twelve individual planters costs about £40 so it’s not cheap, and I suspect that someone handy could knock up something very similar for much less. However, I can imagine it being a boon for a small garden or even a balcony. 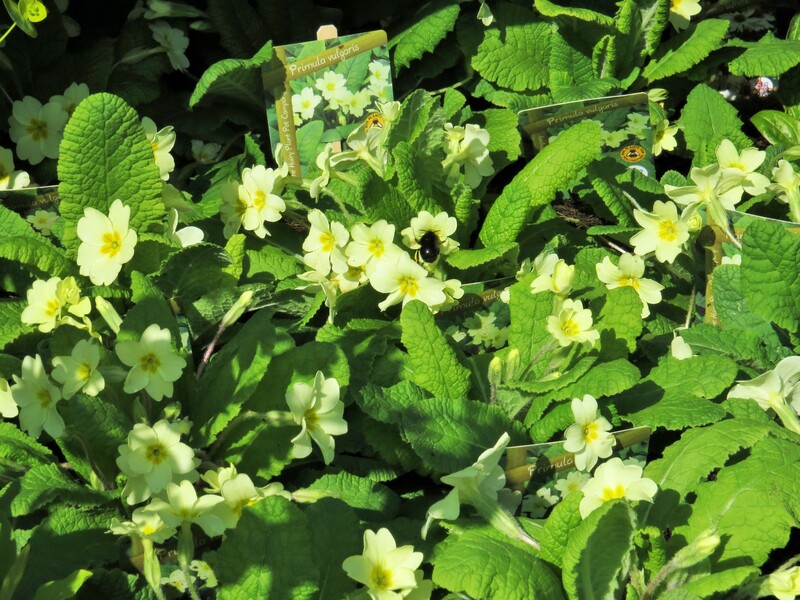 If it was planted up with pollinator-friendly plants it could be abuzz for months. I have to tear myself away though, because I’ve spotted something else. 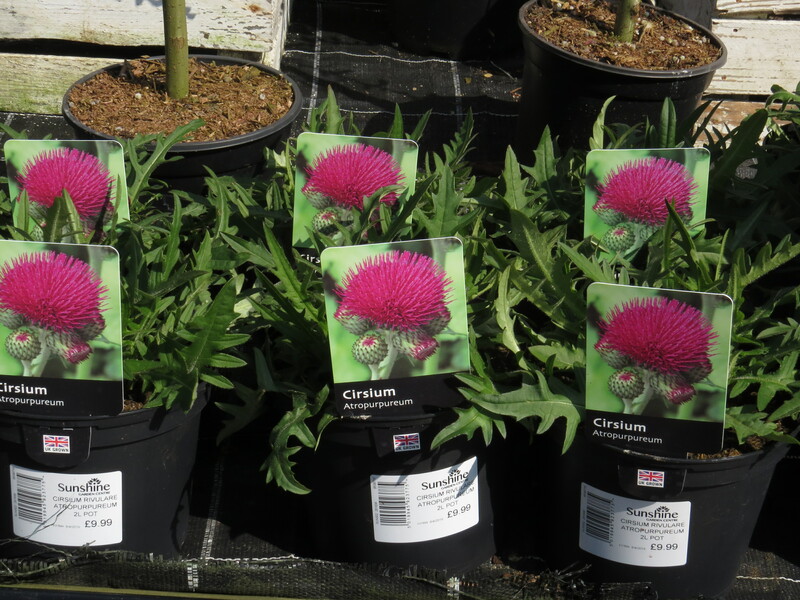 When I first planted up the garden, I had several of these thistles. Sadly, they died off after a couple of years, but while I had them they were the most desirable plants in the whole garden. Bees used to literally faint into the flowers. They are impossible to resist. 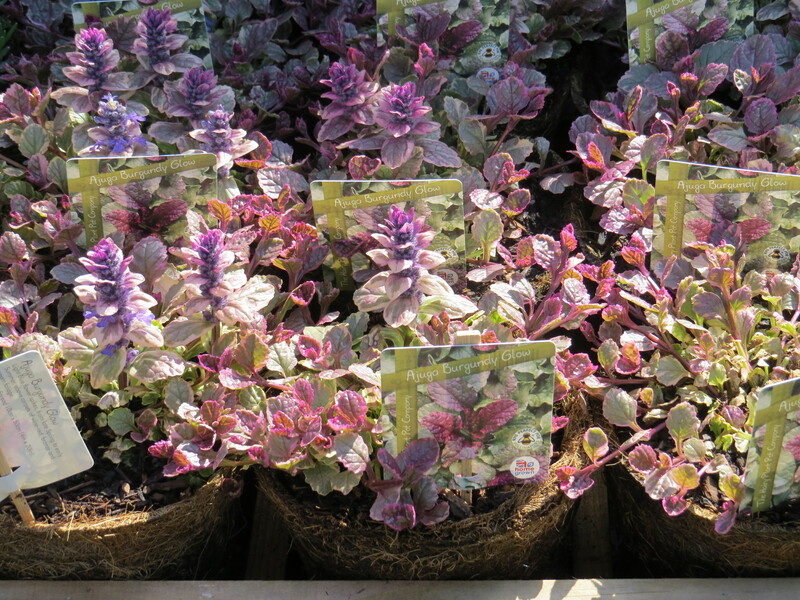 Bowles mauve perennial wallflower – in hairy pots! 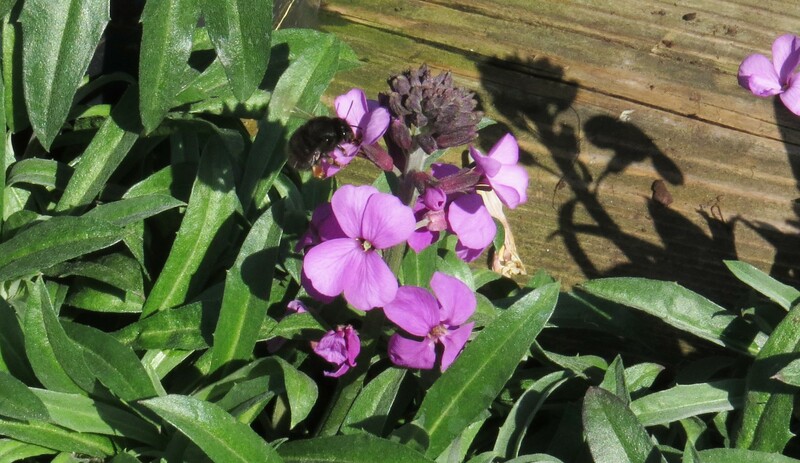 Regular readers will know that I always have some Bowles mauve perennial wallflower in the garden – it is in flower all year round, and the bees love it. 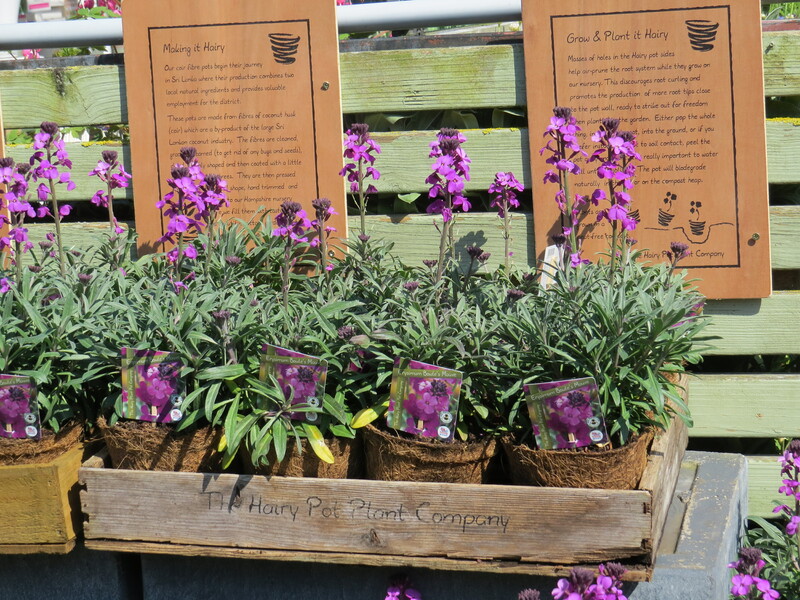 The added bonus here is that they are supplied by the Hairy Pot Plant Company, who sell their plants in coir pots that can be put directly into the ground. 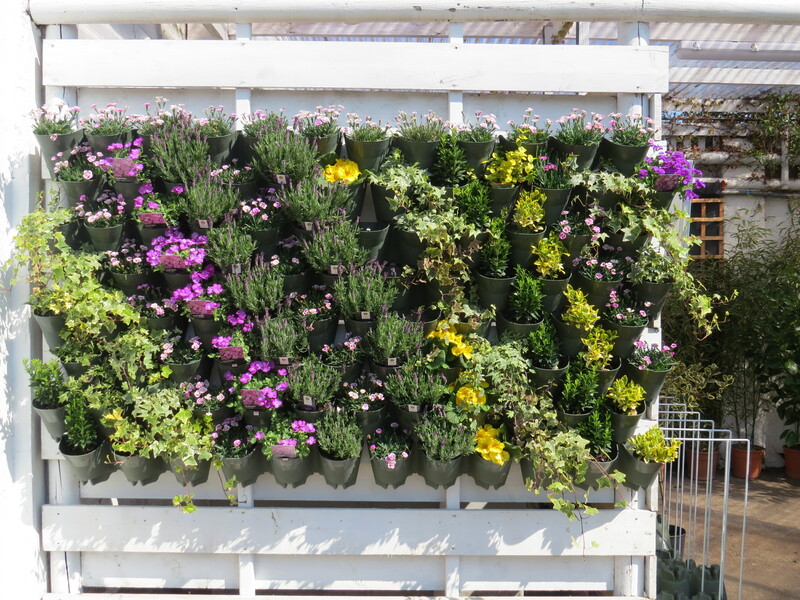 There is so much plastic in your average garden centre, and this seems like an excellent way of cutting back – how ever many times I reuse my pots, I always end up with a great teetering tower of them in the shed. I usually let the bees lead me to the best plants, rather than relying on the ‘pollinator friendly’ bee sign on the label. The garden centre is full of hairy-footed flower bees (Anthora plumipes), one of the first solitary bees to emerge in the southern UK. 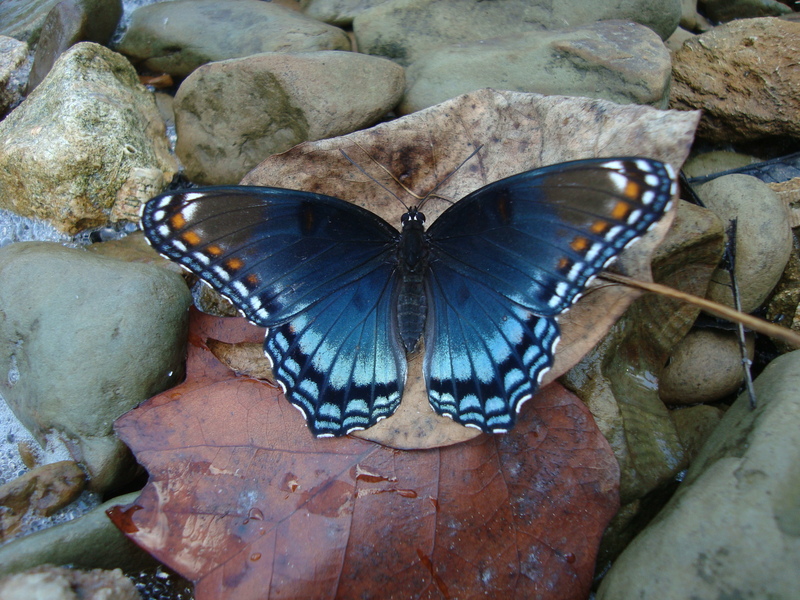 The females are jet black, like one above, and the males are tawny with a distinctive white face. They sometimes fly around with their tongues sticking out, which adds to their charm. I am excited to see that the hairy pots seem to contain nothing but excellent pollinator plants. Pulmonaria and Lamium with yet another hairy footed flower bee. This female has a big splotch of pollen on her thorax. There is pulmonaria, with its flowers that go from blue to pink following pollination. 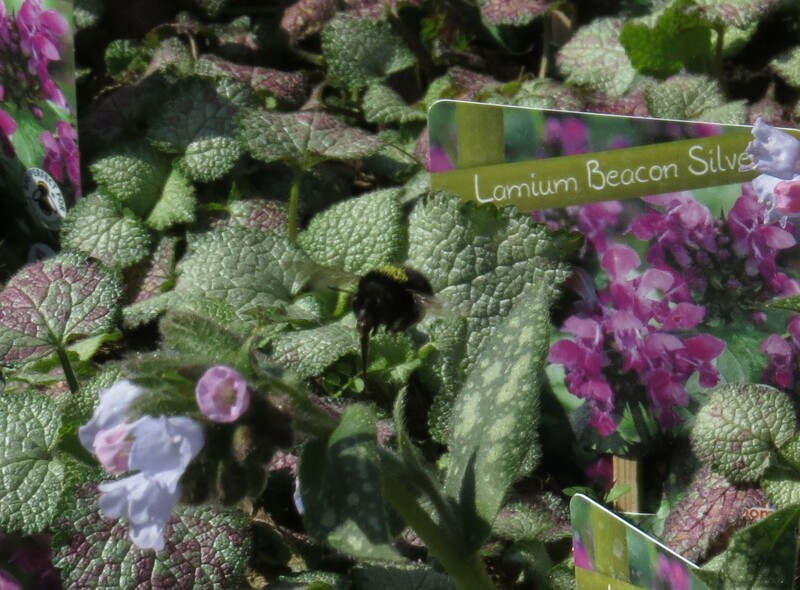 The Lamium is basically domesticated dead nettle, but is another splendid bee plant. There is some very pretty bronze-leafed bugle (Ajuga reptens). And how about these? You might have noticed that the lesser celandine is in full flower at the moment. I didn’t realise that there was a cultivated variety, but this is rather splendid with its chocolate-brown foliage. 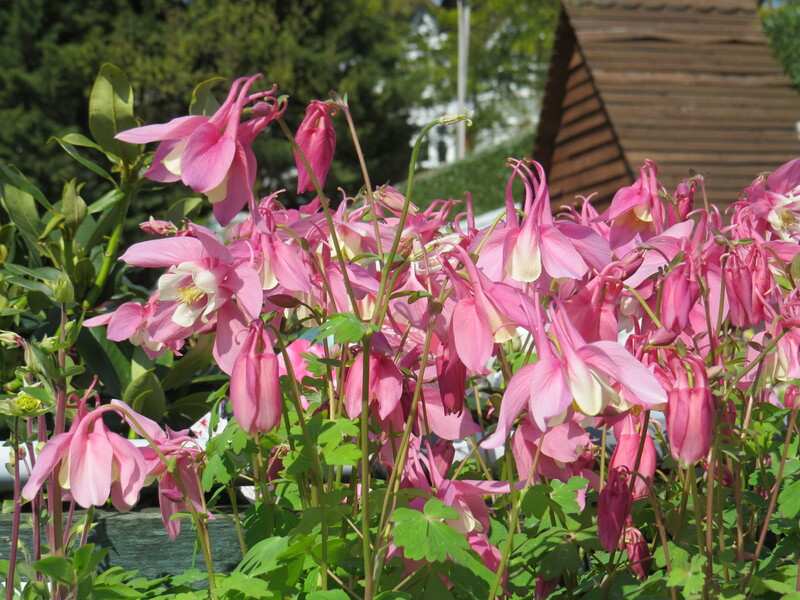 I was musing aloud about whether the plant was as invasive as its wild cousin, and one of the Garden Centre workers suggested that it was ‘vigorous’. To be honest, I don’t mind if something is ‘invasive’ in my north-facing, claggy soiled, heavily treed back garden, but I have resisted this plant so far. Let’s see how strong my resolve is. 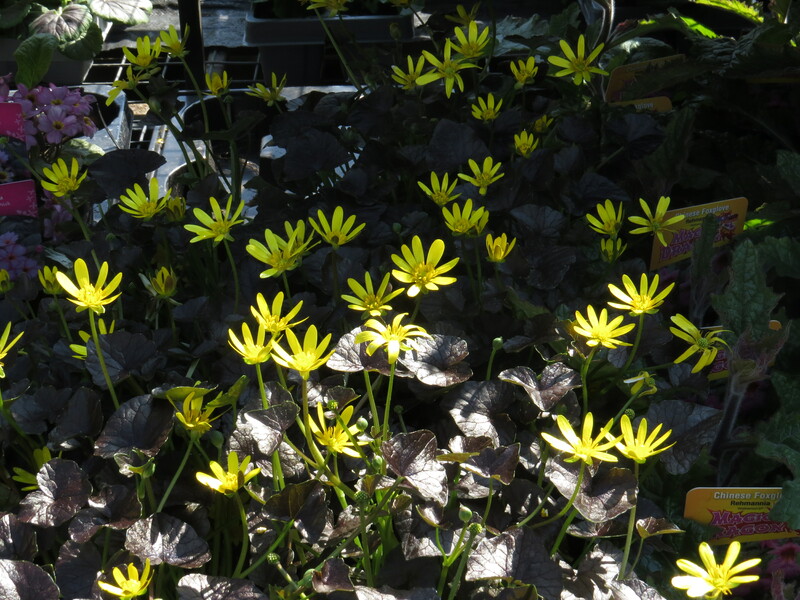 Lesser celandine ‘Brazen Hussy’. 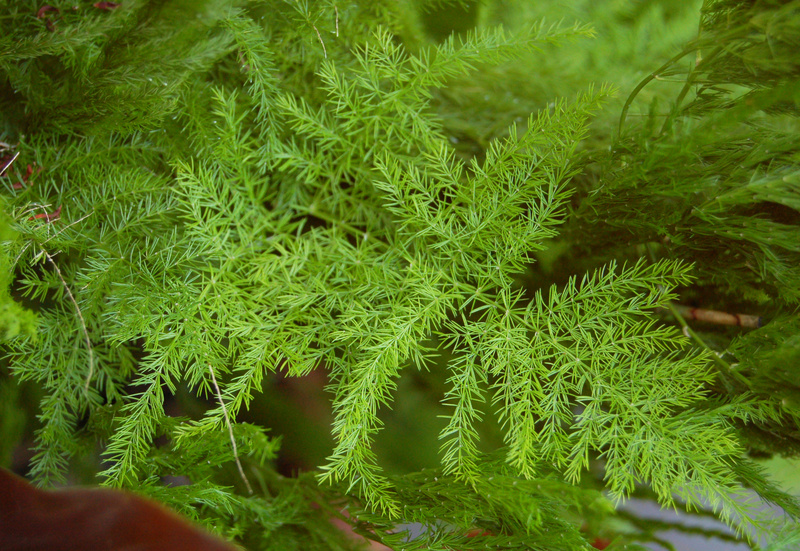 What a splendid plant…. And so I stagger to the checkout with a trolley full of plants and a head full of planting plans, and realise that for a whole hour and a half I haven’t thought about Mum, or Dad, or decluttering the bungalow. Instead, I feel a sense of possibility that I haven’t felt in a while. For a second, I feel almost guilty. And then I remember that I got my creativity from my mother, and my love of nature from Dad, and I know that they would want me to live according to those two principles. I often feel completely stuck, as if I’m buried up to my waist in mud, but something still calls me , step by faltering step, back into life. 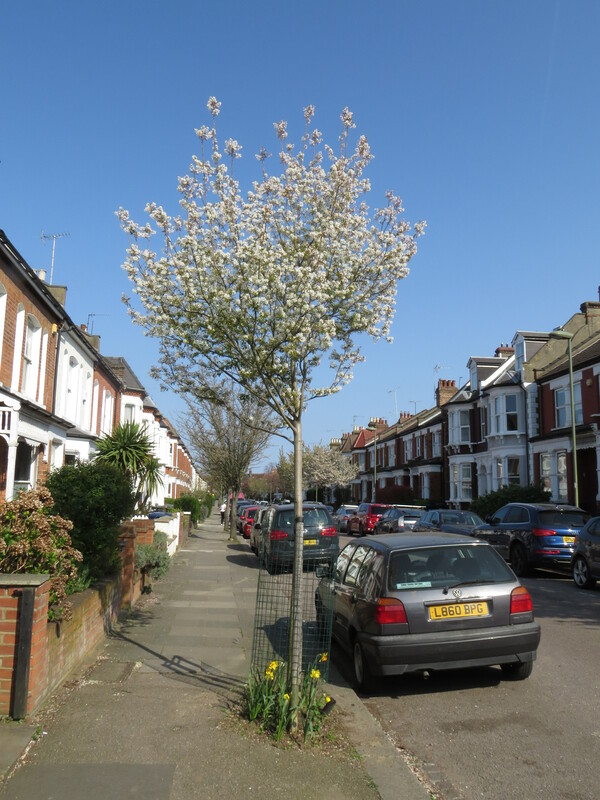 This entry was posted in London Invertebrates, London Plants on April 13, 2019 by Bug Woman. Dear Readers, I am always excited when I see the first English asparagus on sale at Tony’s Continental on East Finchley High Street. 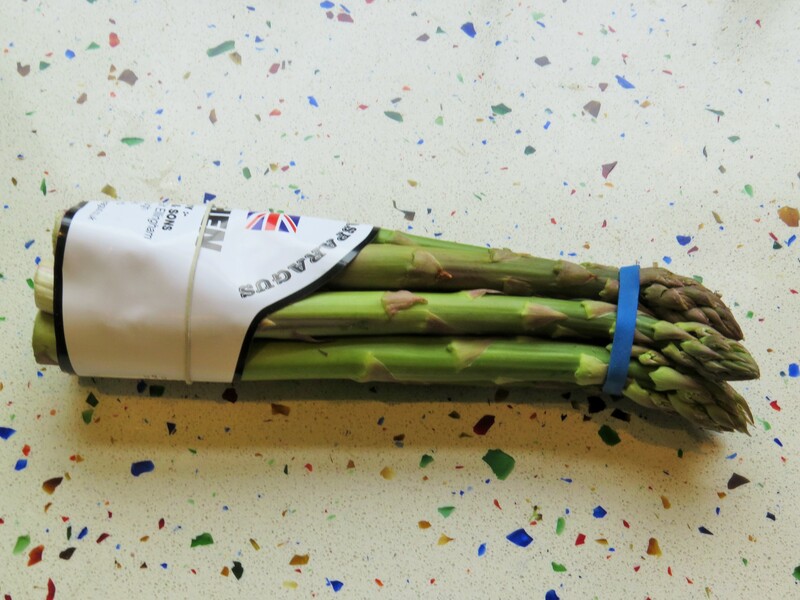 There is usually some asparagus in the shop, but I would rather feast from spring to midsummer on the English stuff than have Peruvian asparagus all year round. Much like the Seville oranges, asparagus is a real seasonal treat and doesn’t taste the same to me at any other time of year. But what exactly is it? What is it related to? And how long has it been a treat? You can see the similarity when compared with the delicate foliage of the ‘domesticated’ plant, here left to go to seed. 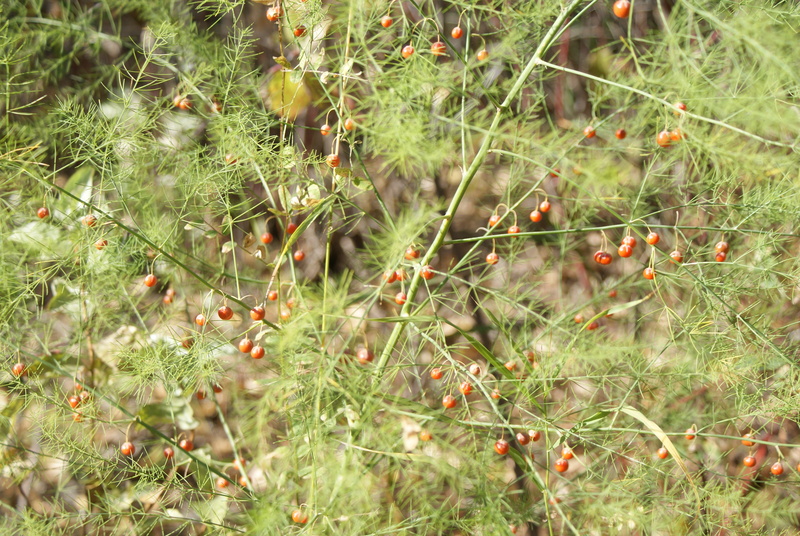 Edible asparagus, in its wild form, was probably a coastal plant – it can certainly grow in soils too salty for other plants, and one way of preparing asparagus beds historically was to suppress the weeds with salt. This did mean that you were stuck with growing asparagus forever in that site, however. The soil needs to be well-drained and also fertile, a tricky combination to achieve. 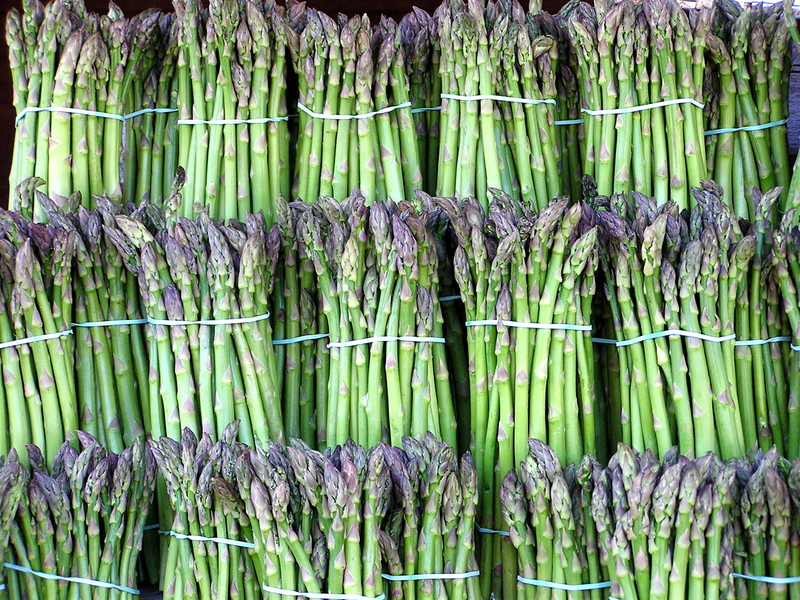 Furthermore, only the young shoots are edible – asparagus quickly becomes woody. When I was working in the Netherlands I noticed how much they preferred white asparagus – this is the same plant but the shoots are ‘earthed up’ as they develop, so that they don’t have access to light and so don’t photosynthesize. My colleagues said that the resulting vegetable was much more delicate in taste, but I always found the white stuff a bit too squishy, preferring the subtle toothsomeness of the green shoots. Each to their own, of course. Asparagus is a favourite regional crop in many places. In the UK the Vale of Evesham in Worcestershire is an asparagus hotspot, and hosts a music festival called ‘Asparafest’ every year. In the US, the city of Stockton in California holds an annual asparagus festival. In Germany, many cities hold celebrations to herald the arrival of white asparagus: those in Bavaria involve lots of beer, naturally, but the city of Berlin’s festival featured the uncontested world record for asparagus peeling by television chef Helmut Zipner, who peeled an entire tonne of asparagus in 16 hours. This earned him the title of ‘Asparagus Tarzan’. 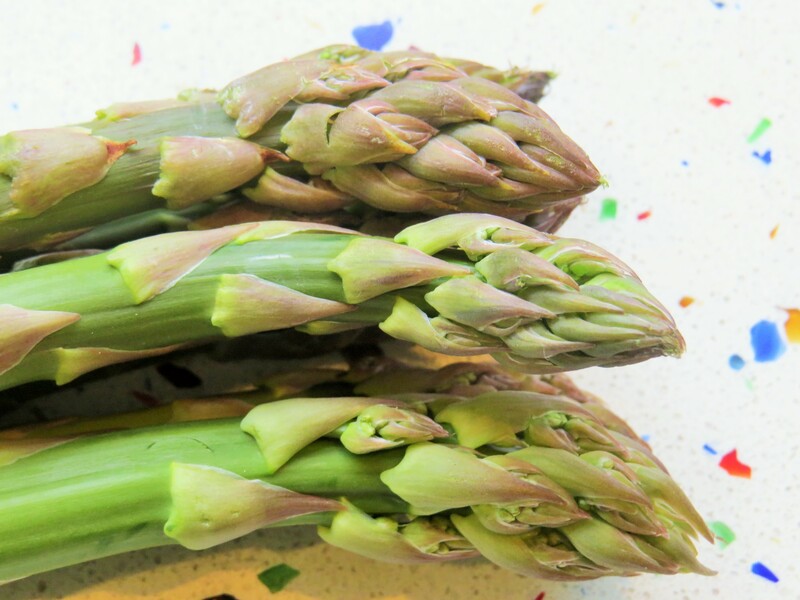 The eating of asparagus has long been thought to have two major effects. 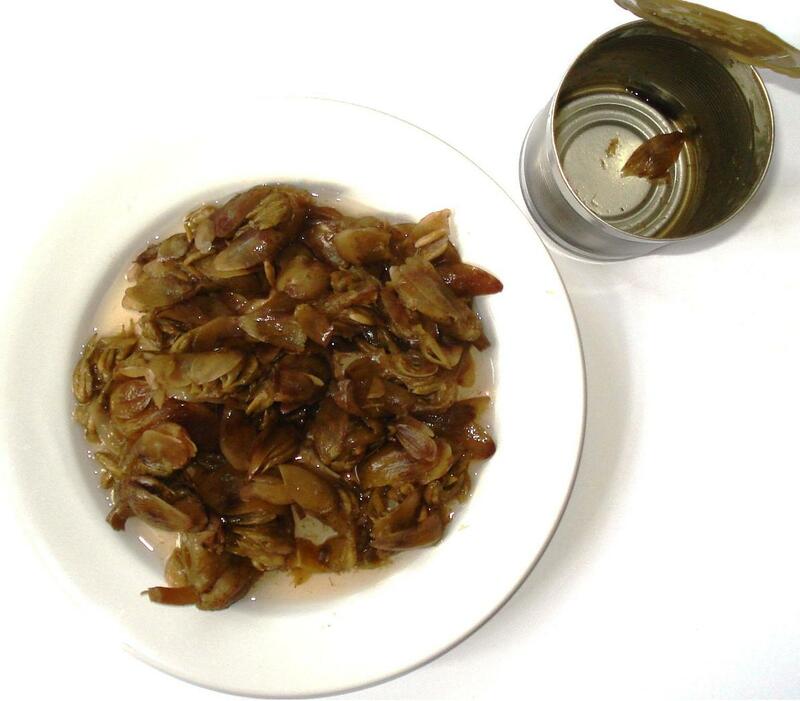 It was long said to be an aphrodisiac, probably because of the shoots’ phallic appearance (if you don’t look too closely) and the fact that they arrive in the spring, when all of nature’s thoughts turn to getting jiggy with it. Madame de Pompadour apparently feasted on them, calling them ‘points d’amour’. However, I would like to concentrate here on asparagus’s historical medicinal qualities. It has long thought to be a diuretic, and to be a useful treatment for urinary disorders, but I wonder how much of this is due to the almost magical way in which asparagus changes the smell of urine? Within 30 minutes of eating the stuff you can tell that you’ve been eating the vegetable, and the effect lasts for up to four hours. I can think of few other foodstuffs that change the smell of one’s bodily secretions so quickly: eating some spices will change the smell of sweat, for example, but not so instantaneously. The change is brought about by the breakdown of a compound called asparagusic acid. For a long time, it was thought that not everyone’s urine changed in aroma, but it has been proved that actually what happens is that some people are genetically less able to perceive the smell. This reminds me of the way that 10% of the population are unable to detect the scent of freesias, though this seems to me rather sadder than not being able to notice the way that asparagus changes the smell of pee. There a multitude of recipes available for using asparagus, but it is possible to go over the top. I once had an asparagus tasting menu in a five-star hotel in Bucharest that featured asparagus icecream with candied asparagus for dessert. Should you fancy repeating the experience, the Farmers Almanac website has asparagus bundt cake and asparagus icecream here. Do let me know how you get on. Asparagus’s alternative name is ‘sparrow grass’, which I rather like. In Turkey, it’s called kuşkonmaz which literally means ‘a bird won’t land on it’, referring to the awkward shape of the plant. Finally, here is a story that combines art and poetry, two of my favourite things. The poem, by Tom Pow, tells the tale much better than I can. overfed, ready for the kitchen. a small oil painting of a single stalk. 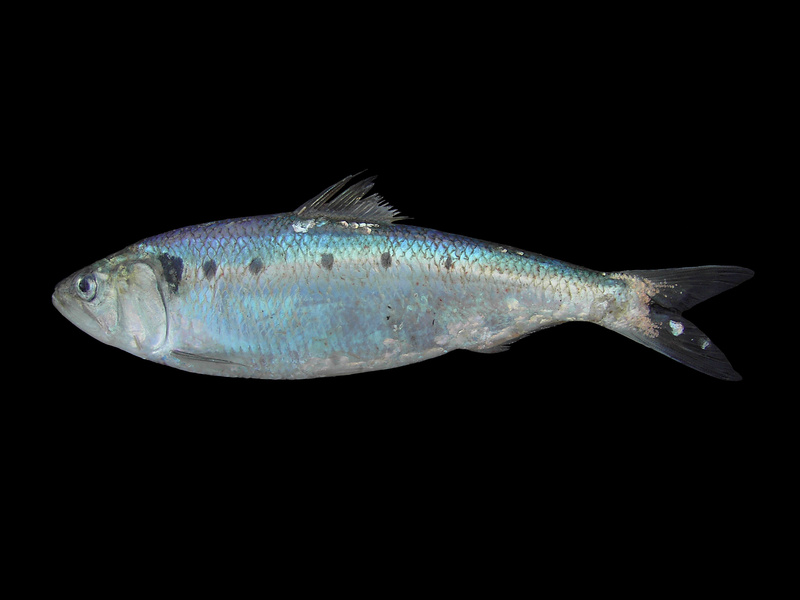 of a fish, lies inert on the marble top. though there is nothing that can save it. 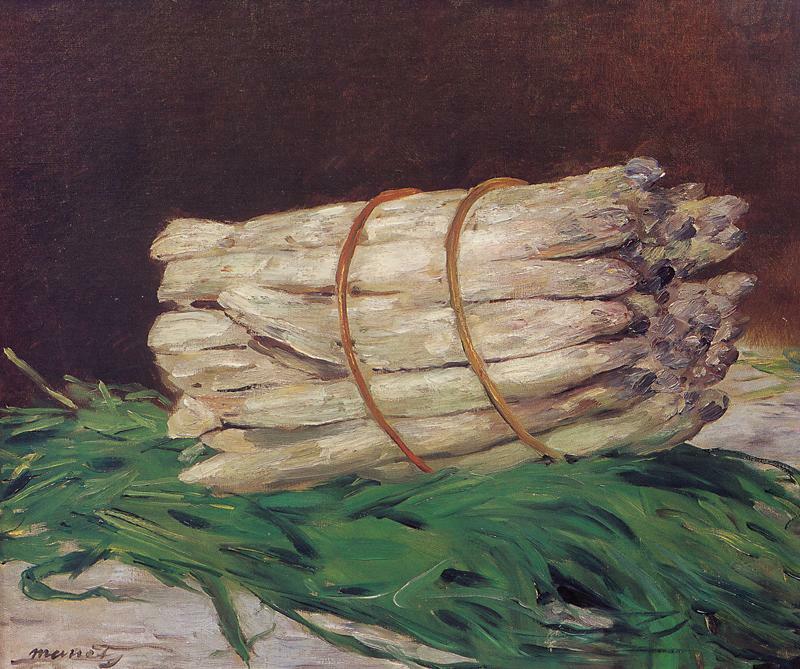 A Bunch of Asparagus by Eduoard Manet (1880) (Public Domain). This small painting was bought by Charles Ephrussi who gave Manet 1000 francs, instead of the 800 francs that Manet had requested. 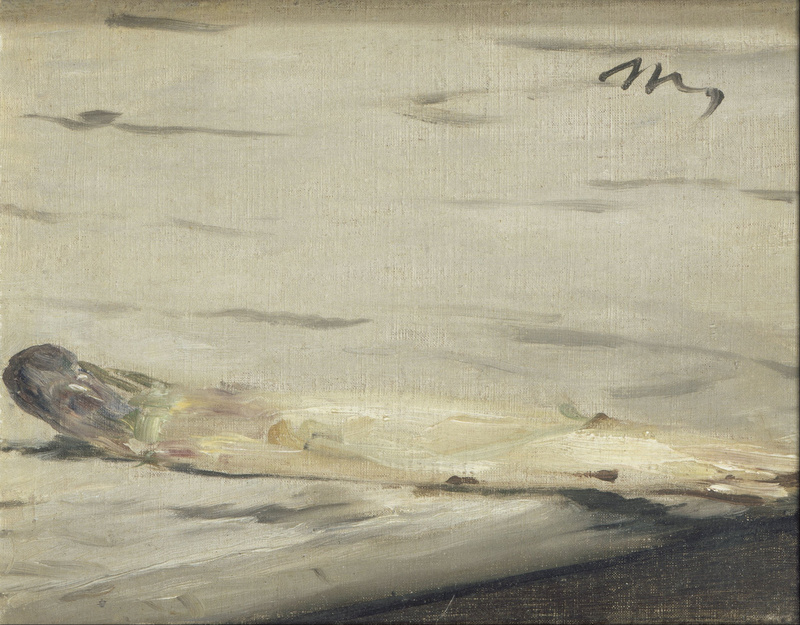 Asparagus by Edouard Manet (1880) (Public Domain) Manet painted this lone asparagus shoot, and gave it to Ephrussi, tellling him that ‘there was one missing from your bunch’. 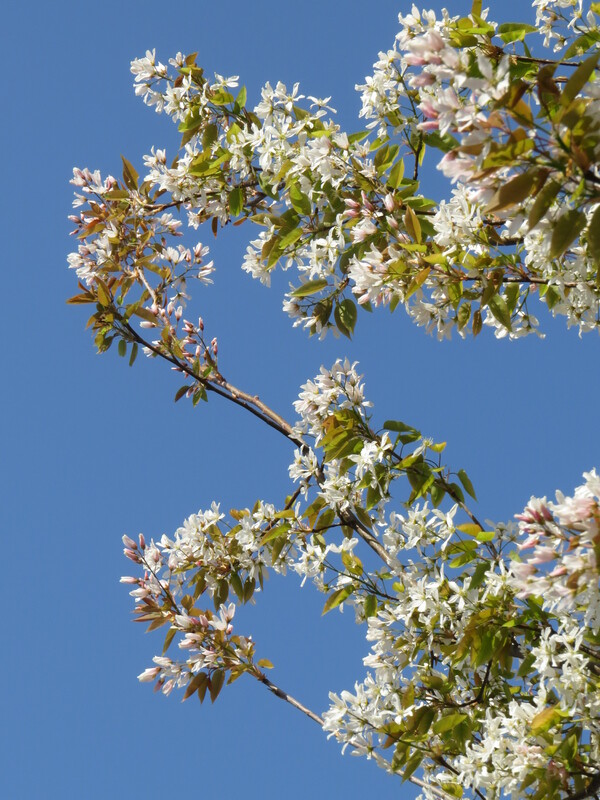 This entry was posted in London Plants on April 10, 2019 by Bug Woman. On the first Mother’s Day since Mum died, I wander around the house like a ghost, unable to settle to anything. I would always have rung Mum to see if she liked whatever pretty thing I had sent her, and to see if the Mother’s Day card had hit the spot. Everywhere I look there are signs of happy families, complete with live mothers. 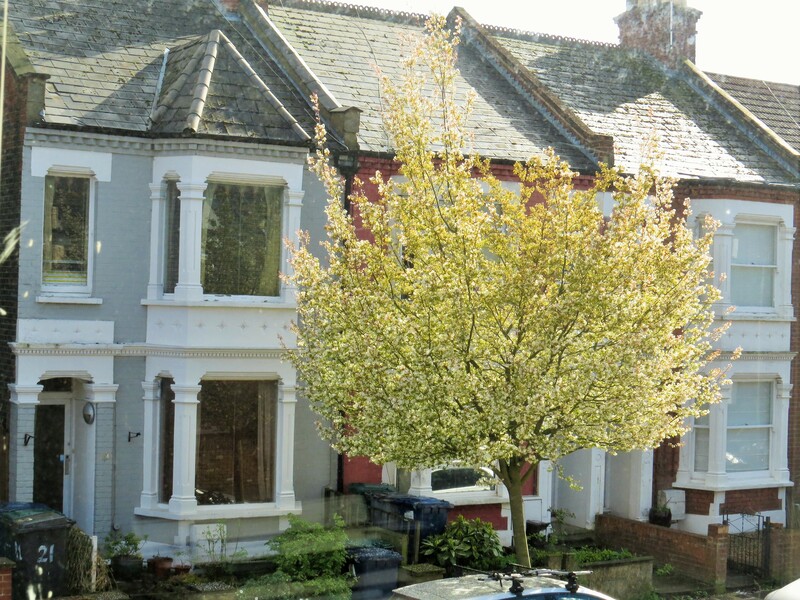 We can’t get into our usual place for Sunday breakfast because it is completely full up from 8 a.m. Muswell Hill is full of young people carrying bunches of flowers. I have joined yet another ‘club’, the ‘Problematic Mother’s Day’ club. For those who have lost their mothers, those who wanted to be mothers and weren’t able to, those who had abusive or alcoholic or troubled mothers, today, like Christmas, throws up the contrast between what things are ‘supposed’ to be like, and how they actually are. Real life is messier, infinitely more complicated. This year, Mother’s Day is about gritting my teeth and getting through, one hour at a time. I do still have one parent alive though, and so I ring the nursing home to see how Dad is getting on. ‘I’m on a boat’, he says. ‘I’ll be gone for forty days’. ‘Where are you going, Dad?’ I ask. I’ve learnt that it’s easier for everyone if I join Dad in Dadland rather than attempting to drag him into the ‘real’ world, where he has dementia and his wife of 61 years is dead. ‘Northern China’, he says, emphatically. I’m not sure if Dad is remembering the business trips that he used to take, or the cruises he went on with Mum, or if this is a metaphor for another journey that he’s taking. But I am sure that it could be all three explanations at once. ‘And I’ve done a picture of a rabbit with a bird on its head’. ‘That sounds fun Dad, I know you like painting and drawing’. ‘Well, they’re a bit less messy’. Dad laughs. There’s a pause. ‘I haven’t been able to talk to Mum. I ring and ring, but she never answers’. I wonder if he has actually been ringing the house and getting Mum’s voice on the answerphone. He is convinced that she is cross with him because one of the ‘young’ female carers at the home ( a very nice lady in her fifties) helped him to have a shower. He went to the funeral, and was in the room when Mum died, but he doesn’t remember. ‘She’s away at the moment Dad’, I say, ‘But she loves you and she knows that you love her’. ‘That’s all right then,’ he says. ‘But I have to go now’. It’s as if, in his dementia, Dad is returned to some earlier version of himself – more placid, less anxious. His calls to my brother have gone from 43 in one day to once or twice a week. I am not sure if this peacefulness will last, or if it presages a movement to another stage in the progression of the disease, but I am grateful for his equanimity. Somewhere inside this frail, vulnerable man there is still my Dad, and I feel such tenderness for him. I walk to the bedroom and look out of the window. There is something totally unexpected in the garden. 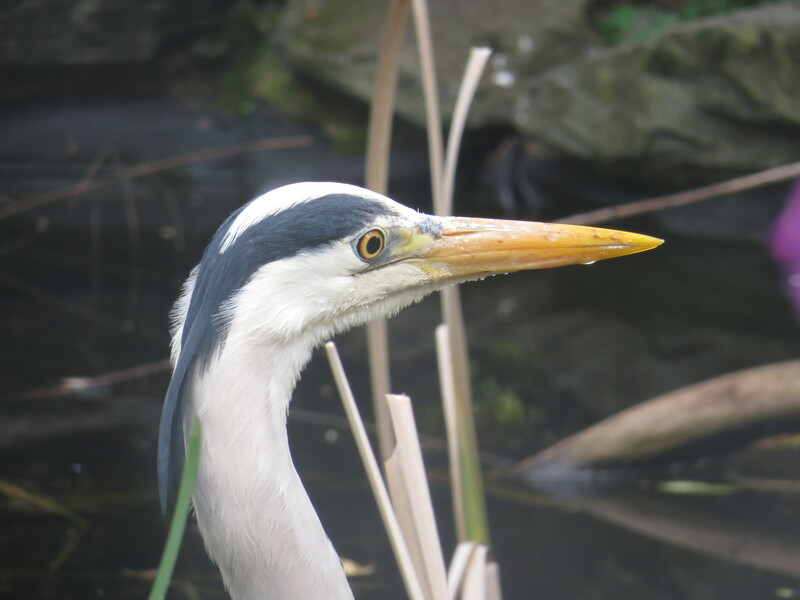 A grey heron is in the pond, and, as I watch, s/he spots the rounded head of a frog. Once the bird is locked on target, there is no escape. The heron darts forward, squashes the frog between the blades of its bill and waits, as if uncertain what to do. 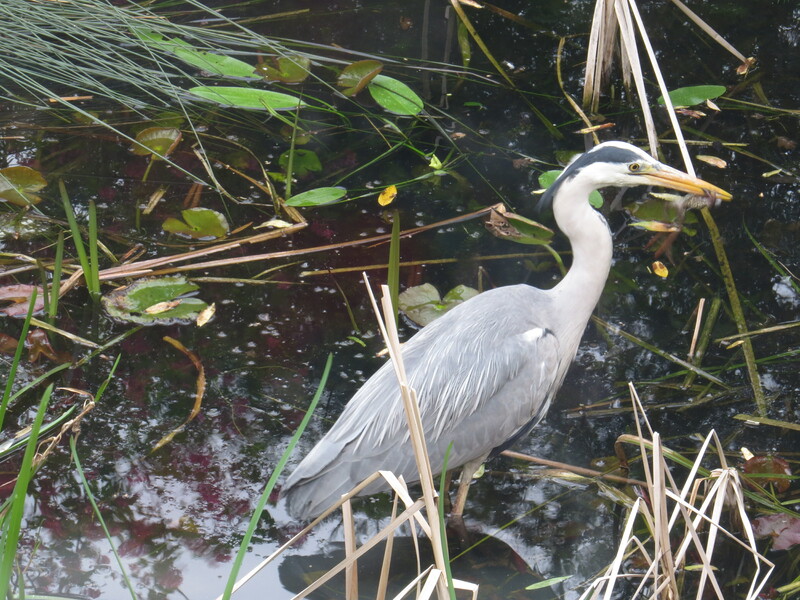 The frog wriggles, and the heron dunks it into the water, once, twice. And then the bird throws back its head and, in a series of gulps, swallows the frog alive. I don’t know what to do. 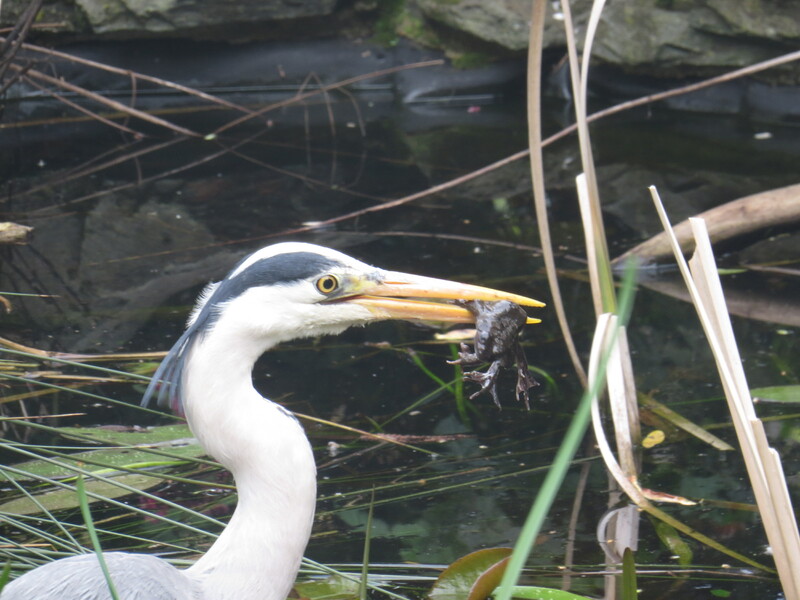 I feel protective towards the frogs, but the heron needs to eat too. 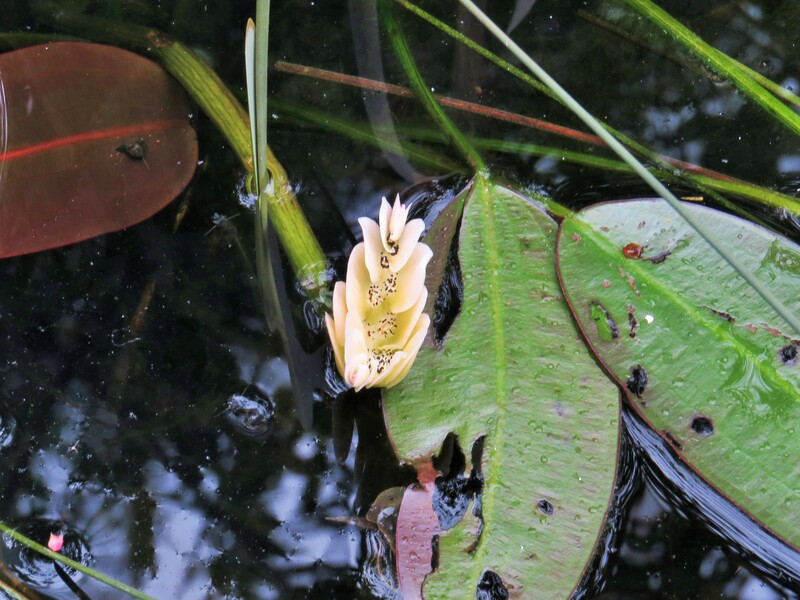 The frogs have bred and there is spawn in the pond, so from a scientific point of view there is no need to be sentimental. But still. 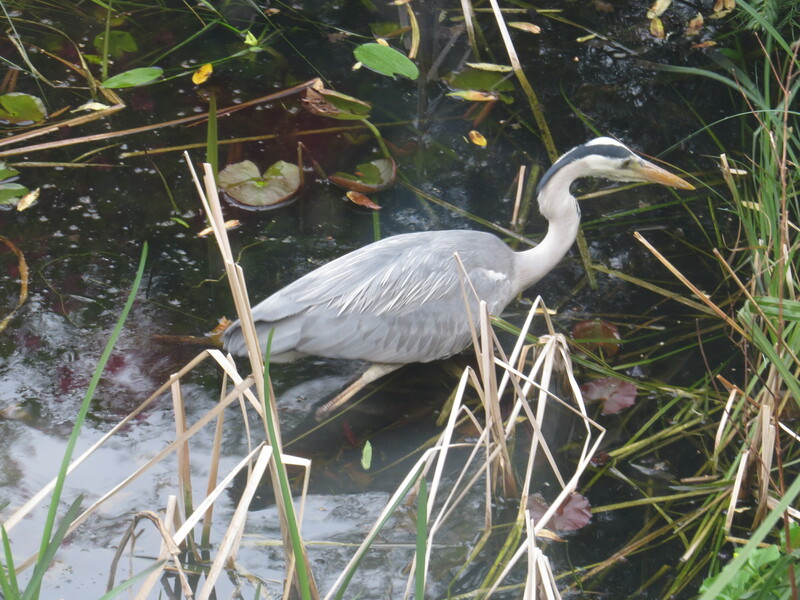 I have been away in Canada for two weeks, and I suspect that the heron got used to visiting when things when quiet. The pond must have had a hundred frogs in it when we left. Hopefully some of them quit the water once the breeding was over, because on today’s evidence the heron could happily have eaten the lot. What a magnificent creature, though. It is such a privilege to have a visit from a top predator. Close up, I can see the way that those yellow eyes point slightly forward to look down the stiletto of the beak, and the way that the mouth extends back beyond the bill, enabling an enormous gape. The plume of black feathers at the back of the head show that this is an adult bird, perhaps already getting ready for breeding. S/he leans forward, having spotted yet another frog, and I decide that I’ll intervene. I unlock the back door and open it, but it isn’t until I’m outside on the patio that the bird reluctantly flaps those enormous wings and takes off, to survey me from the roof opposite. 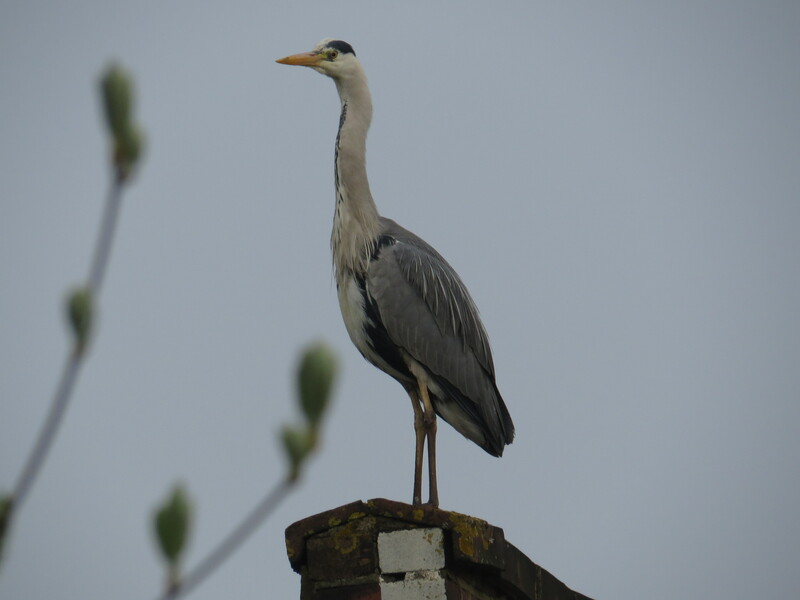 I know that I won’t deter the bird for long – after all, I will leave the house, and the heron will be back. But there has been so much loss in my life in the past few months that I feel as if I have to do something. The delicate bodies of the frogs seem no match for that rapier-bill and there is something unfair about the contest in this little pond that riles me. We are all small, soft-bodied creatures, and death will come for us and for everyone that we love with its cold, implacable gaze, but that doesn’t mean we shouldn’t sometimes throw sand in its face. 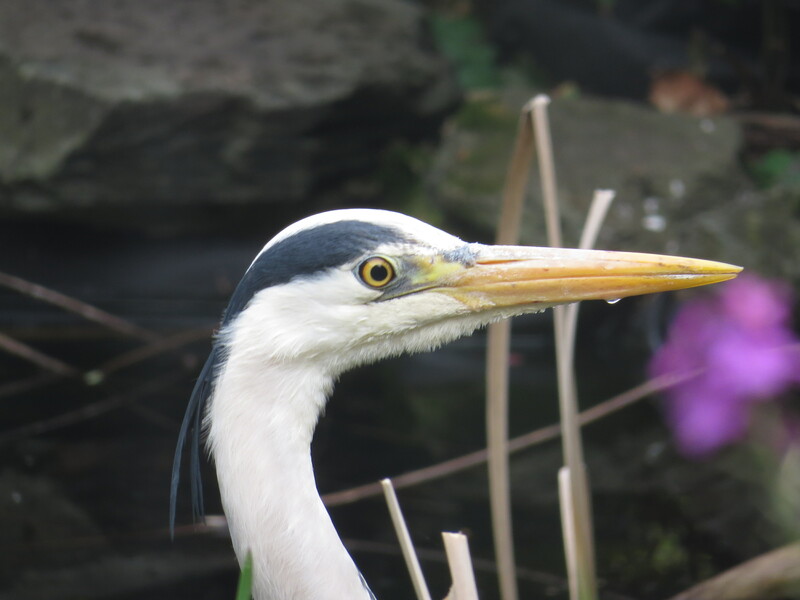 I am so lucky to have the graceful presence of the heron in my garden, but today, I want to tip the balance just a little in favour of the defenceless. 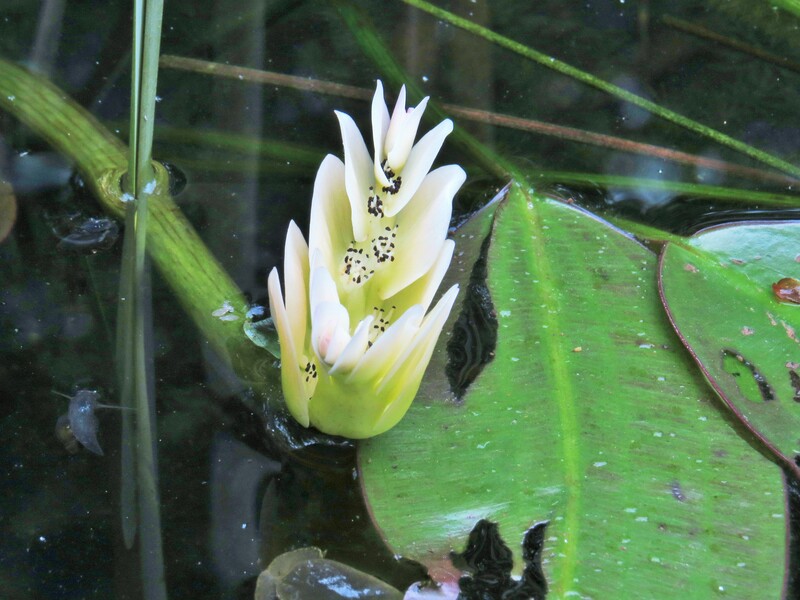 This entry was posted in London Amphibians, London Birds on April 6, 2019 by Bug Woman. 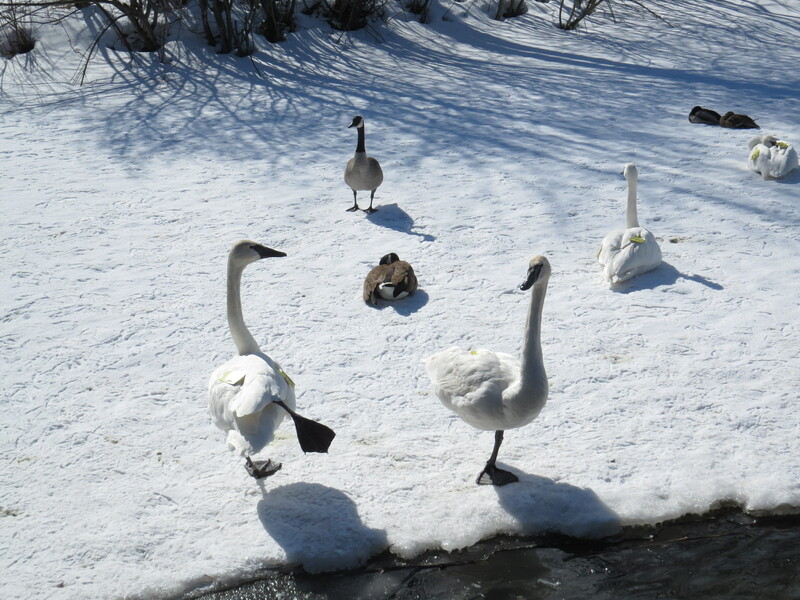 One of these swans is not like the others…. Dear Readers, it’s always such a pleasure to arrive in Canada and to spend some time in Collingwood, Ontario before heading down to the hurly-burly of Toronto. On Sunday, I went for a walk with my husband’s aunt L and their soft-coated wheaten/schnauzer mix Charlie. Most of the bay was frozen, and so the waterfowl were huddled together. There were lots of mute swans (Cygnus olor) with their bright orange bills, but right in the middle was a slender, black-billed swan. It was my first sight ever of a wild trumpeter swan (Cygnus buccinator) and I was immediately taken with how elegant and self-possessed the bird appeared. Furthermore, he had a bright yellow wing tag, and so we could identify him as T29. The internet is a wonderful thing, and I was able to ascertain that T29 was born to parents K09 and 038 who nest near Chatsworth. His parents and six of his siblings moved on to Port Credit, near Burlington, but T29 did not, and was spotted with his sibling T28 in Thorold. Now, T29 seems to be on his own, and is tolerated by the mute swans. Occasionally he bobs his head and calls, and I hope that some other trumpeters soon fly over and he can join them. 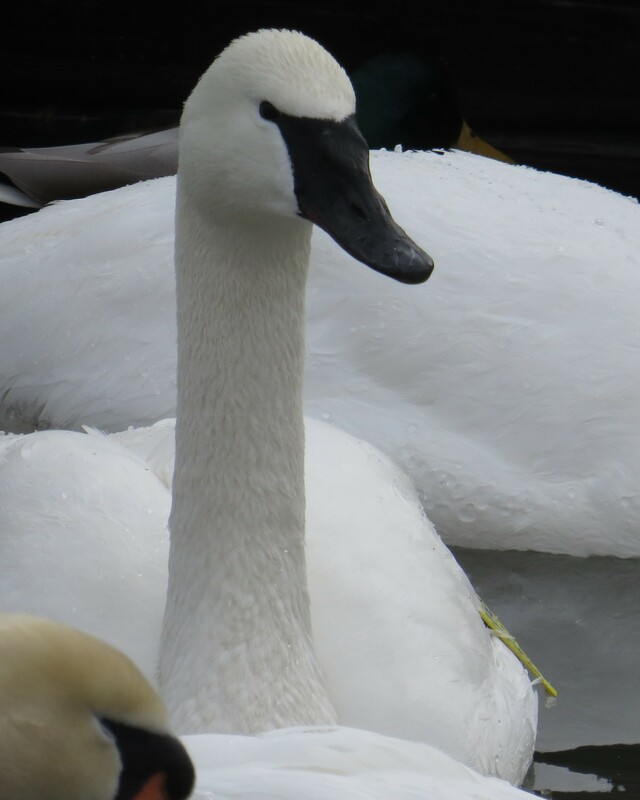 However, trumpeter swans don’t breed until they are 5 to 7 years old, with some swans waiting until they are in their late teens. Like other swan species they normally mate for life, so it makes sense to wait for the right partner to come along. In this of course, as in all things, I am reminded of Mum and Dad, and their 61 year marriage. ‘Till death us do part’ was accurate in their case, as it is with most swans (although ‘divorces’ are not completely unheard of). I once asked Mum what she thought the secret of a long happy marriage was, and she thought for a few moments. ‘There’s a lot of luck involved’, she said. ‘You’re a completely different person at 40 from how you were at 20. If you’re lucky, you’ve both changed in ways that your partner can cope with. Otherwise, it can be very tricky’. And I’m sure she’s right. I hope that life is simpler for swans than for humans, and that they have less personality change to worry about. 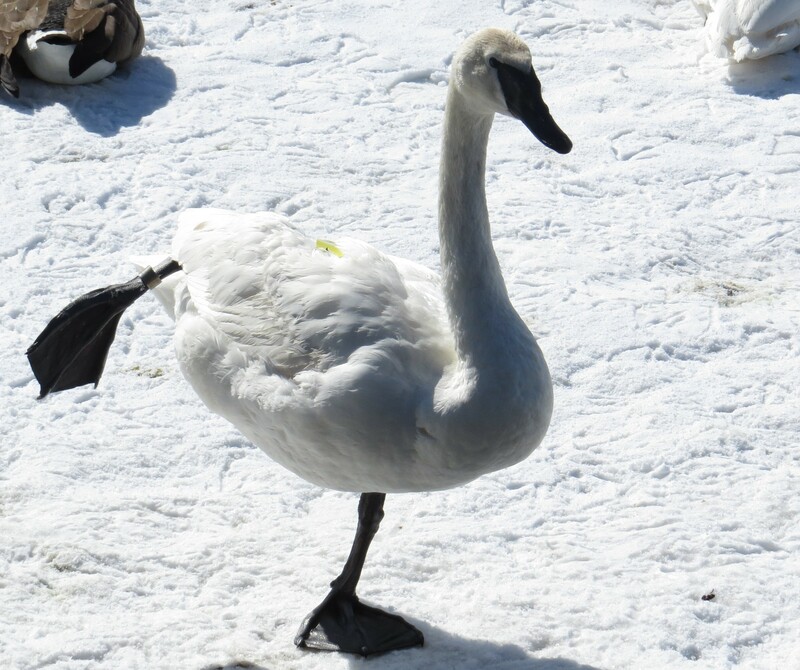 But back to the trumpeter swan. Its beak is the longest of any waterfowl, and they also have a very long neck, which is not curved like that of the mute swan. They are also noisy birds, as their name would suggest (the Latin buccinator means ‘trumpeter’). See if you can pick out the sound of the trumpeters in amongst the Canada geese in the video below. Yet the sound of trumpeter swans wasn’t heard in Ontario for over a hundred years – the bird was driven to extinction in the province by hunting and habitat destruction. 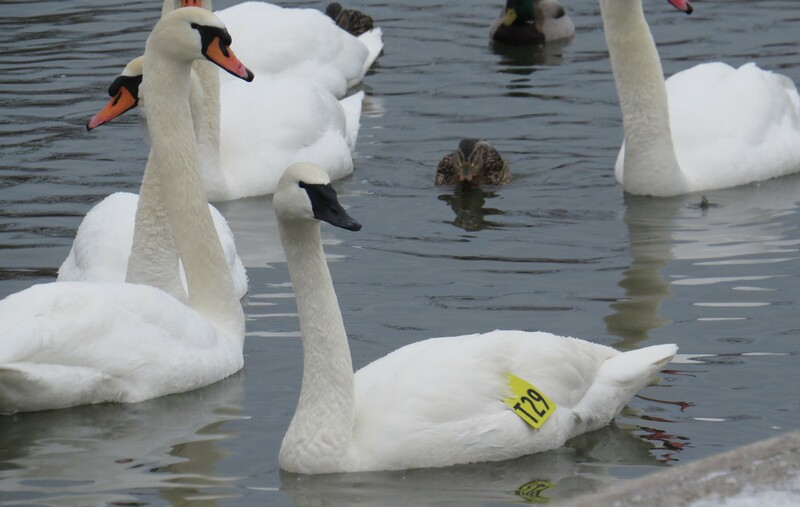 Unlike the more tolerant mute swans, trumpeters breed in wild marshland where they will be undisturbed by humans, a habitat which is becoming harder and harder to find. Fortunately, in 1982, a biologist named Harry Lumsden set about a project to reintroduce the bird to its former heartland by rearing eggs taken from trumpeters in Western Canada (if an egg is taken from a nest at the right time, the mother will often lay another egg, leaving the original one free to be reared elsewhere). The birds were then released on wetlands across Ontario. Over 500 were released in the twenty-five years of the project, and there are now almost 2000 wild birds. 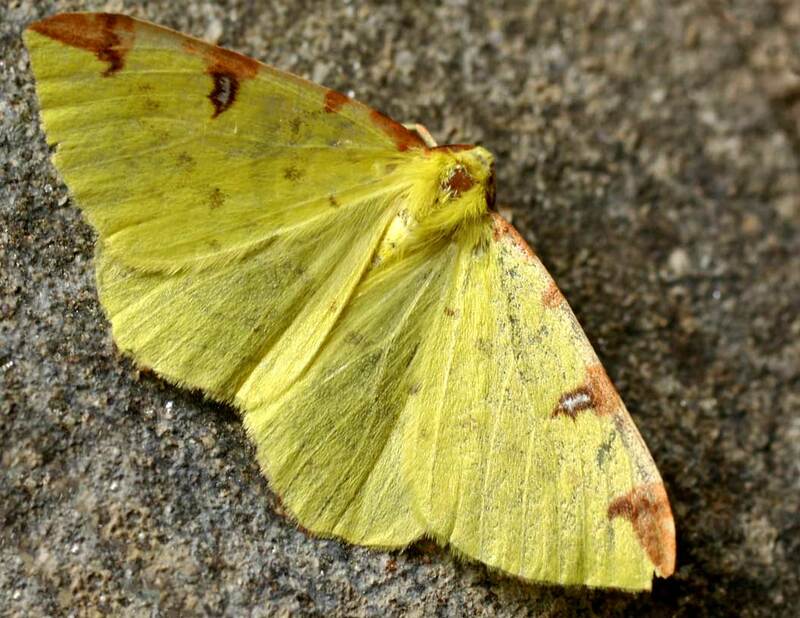 Many of them can be seen at the original Wye Marsh site, where they overwinter before moving north to breed. So, it is always a pleasure to see a new species, but I was even more delighted to spot these geese. 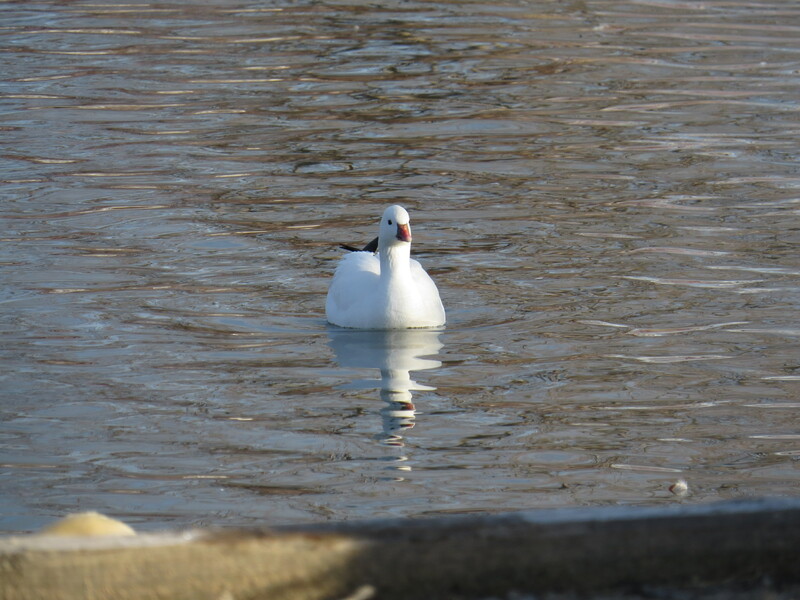 At first glance I thought that they were snow geese, but a closer look at the field guide revealed them to be Ross’s geese (Anser rossii), a very attractive small goose that breeds in northern Canada and normally overwinters as far south as Mexico. I figure that these two were downed by the cold weather, and will soon be heading much further north. My misidentification of them as snow geese was, I think, forgivable ( I blame the jetlag), but they are about 40% smaller, and have a softer, rounder appearance. 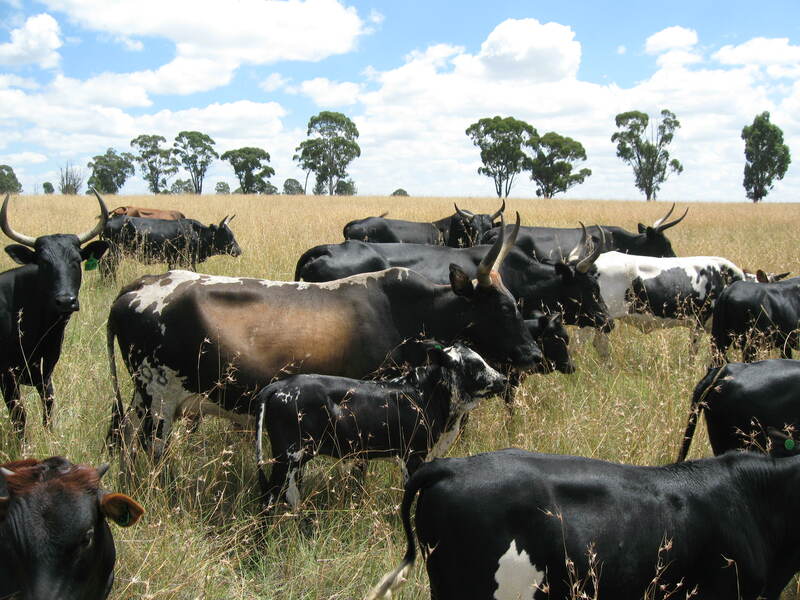 Also, they have grey colouration at the base of their bills, and much shorter necks. This pair kept a very low profile, avoiding any interaction with the other waterfowl. It seemed clear to me that they didn’t plan to hang about, and indeed, on the day that we headed to Toronto they disappeared. It’s difficult to describe the subtle delight of gradually getting to know the birds of a different country. I recognised the call of the first red-winged blackbirds who had arrived to claim their territories, and the pair of cardinals on the bird-feeder felt like old friends. I know that it is only the tip of a massive ornithological iceberg, but it feels like a good start. During this period of my life when so much has changed, I love the way that Canada is beginning to feel like a second home. There is so much to love about its wild places and its kind, generous people. 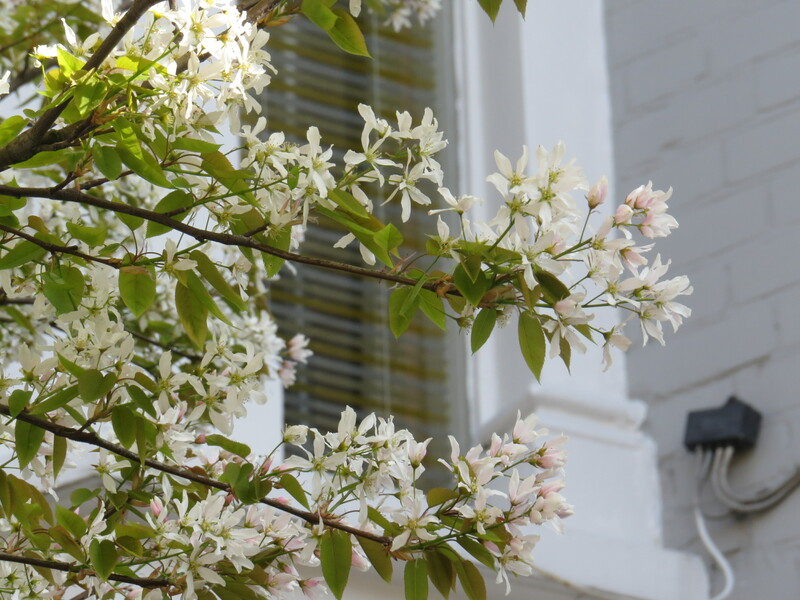 This entry was posted in Bugwoman on Location on March 30, 2019 by Bug Woman. Dear Readers, you may will be worrying about the state of my mental acumen at the moment. It’s very clear that the two jars above are definitely not weeds. They do, however, contain one of my favourite seasonal ingredients, Seville oranges. These strange, bitter, seed-filled fruits appear in December and are gone by February – indeed, what with Mum’s death and Dad’s deterioration, I managed to grab the very last of the fruit in Tony’s Continental on East Finchley High Street. It’s surprising to me that many customers buy Seville oranges to eat, and have to be gently advised that this isn’t a good idea by the kind folk in the shop. 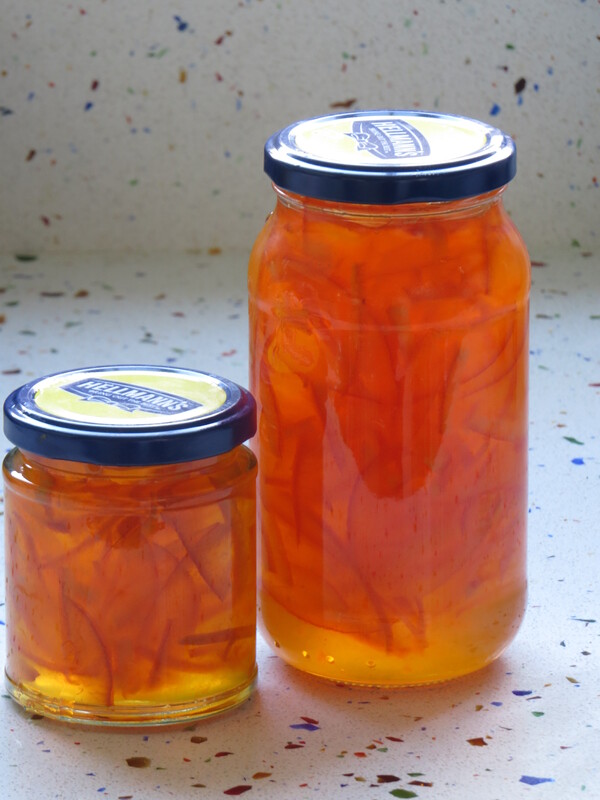 I suppose that marmalade making is a bit of a faff, but the result lasts all year (well, if you don’t give it all away) and there is such a pleasure about the long process of it, the cutting up of the rind and the testing of the set. It is one of those things that I always do at the start of the year. I was in two minds this time, because of course Mum was always a key beneficiary, but in the end I found it comforting rather than distressing. Let’s never underestimate the soothing powers of cooking, and of ritual. It takes quite a leap of imagination to go from the knobbly, parsimonious Seville orange to those jars of golden unctuousness, but someone must have decided to put it to the test a long time ago. 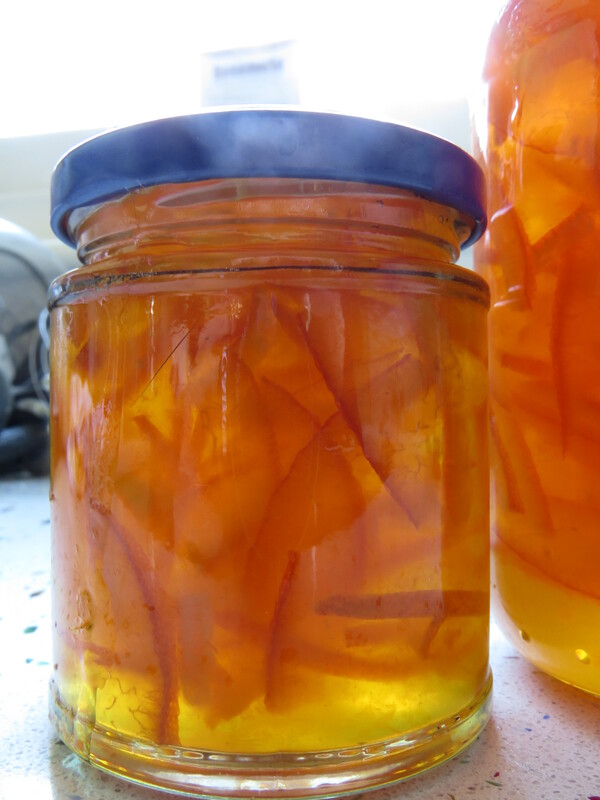 The fruit is high in pectin, which helps with the set of the marmalade. It is actually grown in Spain, particularly Andalusia, so for once the popular name is actually correct. The fruit has been shipped to the UK from Portugal and Spain since at least 1677, the date of the first extant recipe for ‘marmalet’. But what actually is it? It’s believed that the Seville orange is a cross between two other varieties: Citrus maxima, otherwise known as the pomelo, gives the fruit its sourness, and Citrus reticulata, the mandarin orange, gives it its orange colour. These two fruits, along with several other varieties of citrus, are the ‘parents’ of all of the rapidly multiplying tribe of tangerines, nadacotts, pink grapefruit and clementines that grace our shelves. 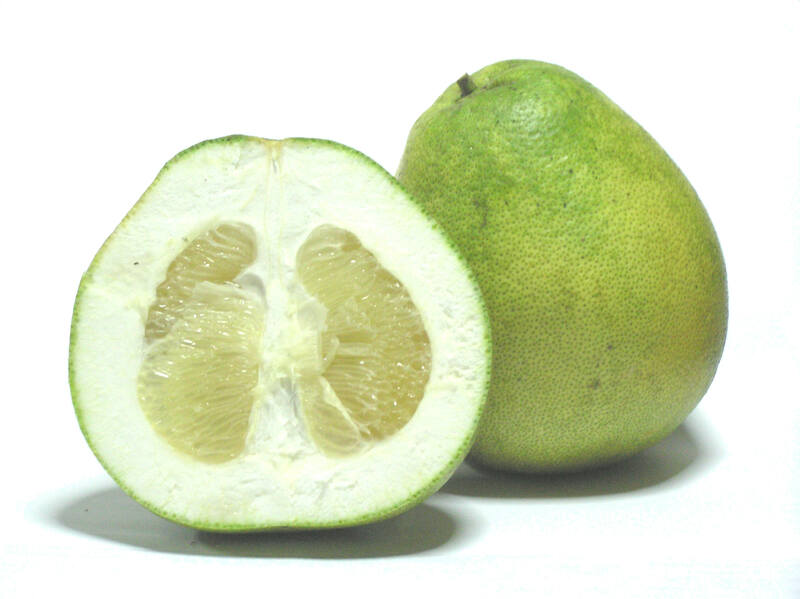 Most have been bred for sweetness, ease of peeling and juiciness. The Seville orange stands out as a fruit of grumpiness and character in this good-mannered company. 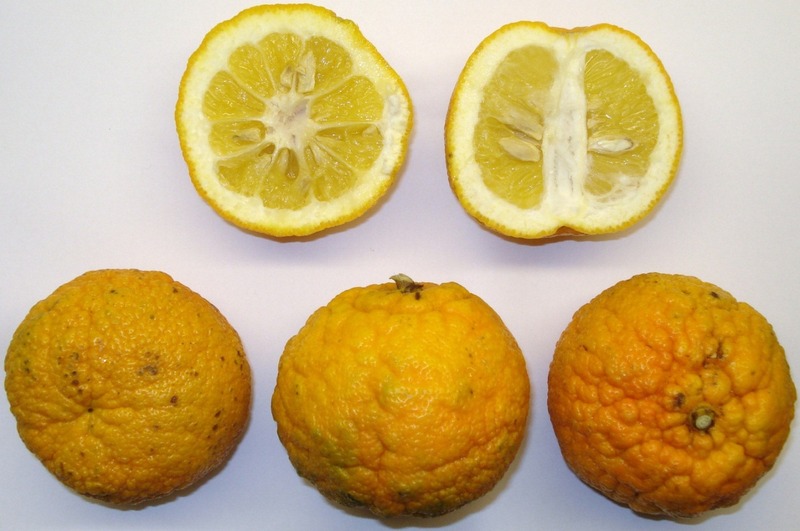 Incidentally, the Seville orange’s sourness puts it in the same category as grapefruit when it comes to dangerous interactions with some drugs, such as those used for chemotherapy and to prevent the rejection of transplanted organs. At least no sensible person will be drinking Seville orange juice, and I suspect that unless you are a real fan of marmalade the risk is quite low, though I would check with your doctor if you are tempted to indulge. 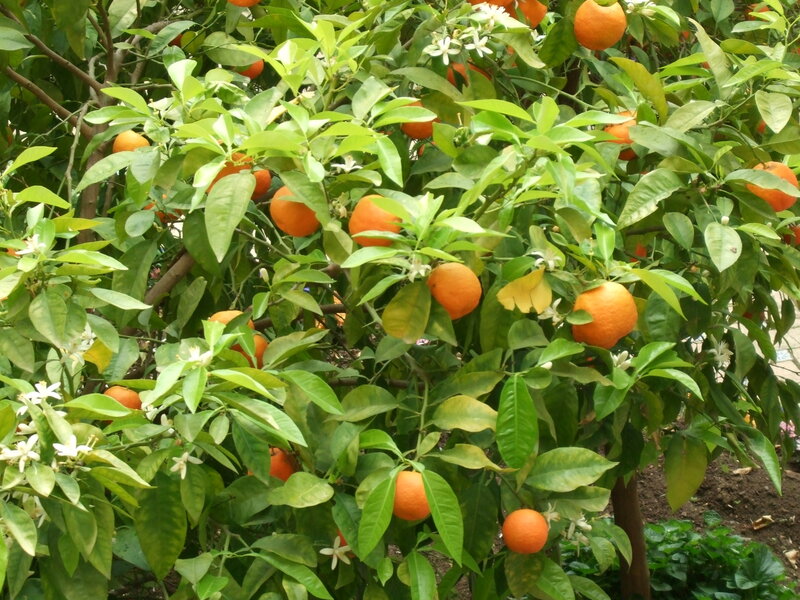 Seville oranges probably arose naturally in south western Asia, particularly Vietnam, where the growing of an orange tree is said to bring happiness. The plants were exported all over the world by Arab traders, who loved to use them in their courtyards for their fragrance and their golden fruits. 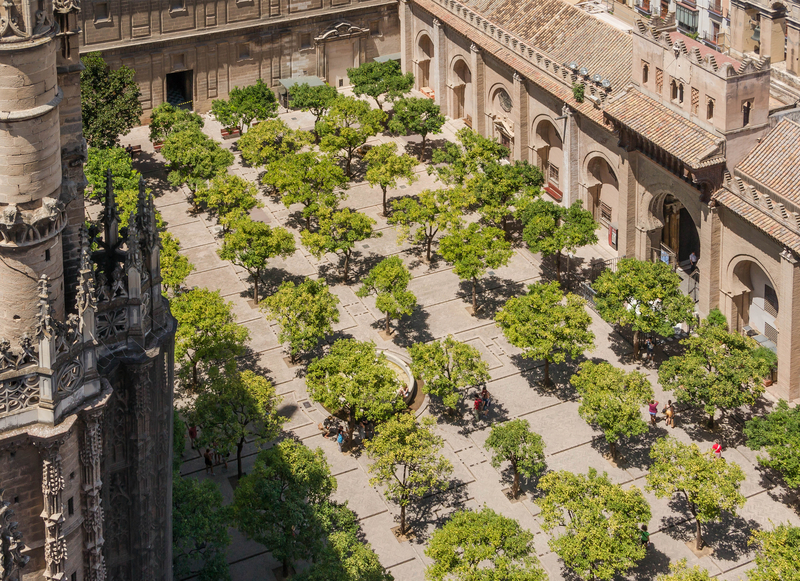 Most famously, more than 14,000 of the trees line the streets of Seville, and I imagine that the scent of the flowers is heavenly, though getting dunked on the head by a toppling, overripe orange might also be a hazard. 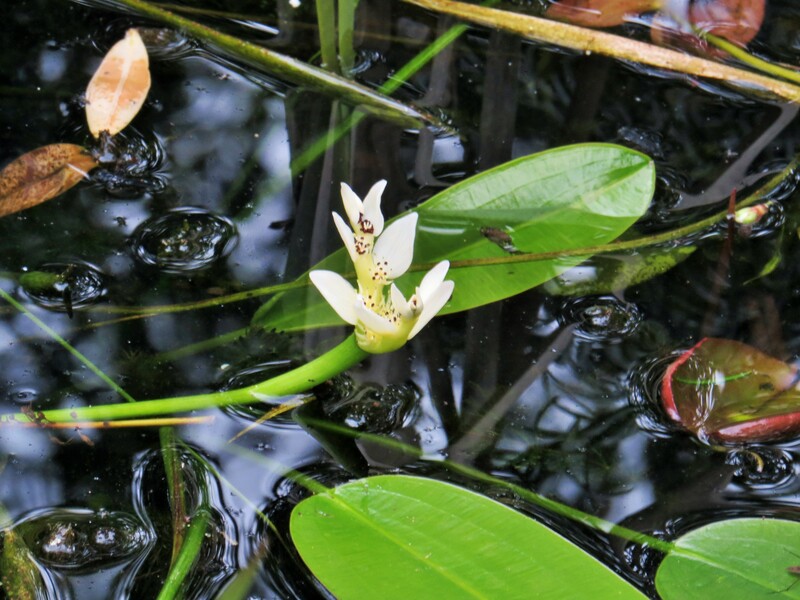 The Moors cultivated them in Spain from at least the Tenth Century, and there are wild groves of the plant in Florida and The Bahamas which were brought there by the Spanish. And no wonder. 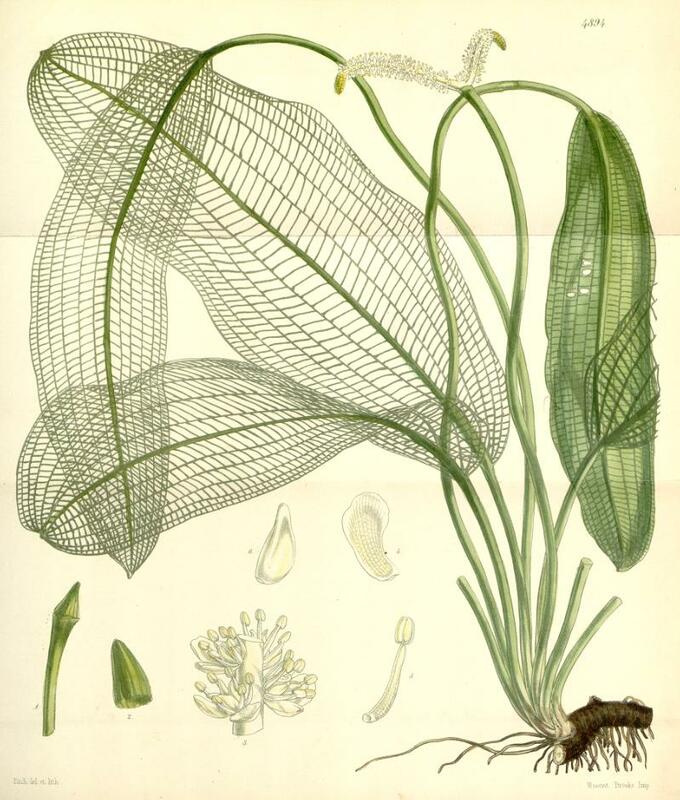 Although the fruit is used for marmalade, it has a multitude of other uses. 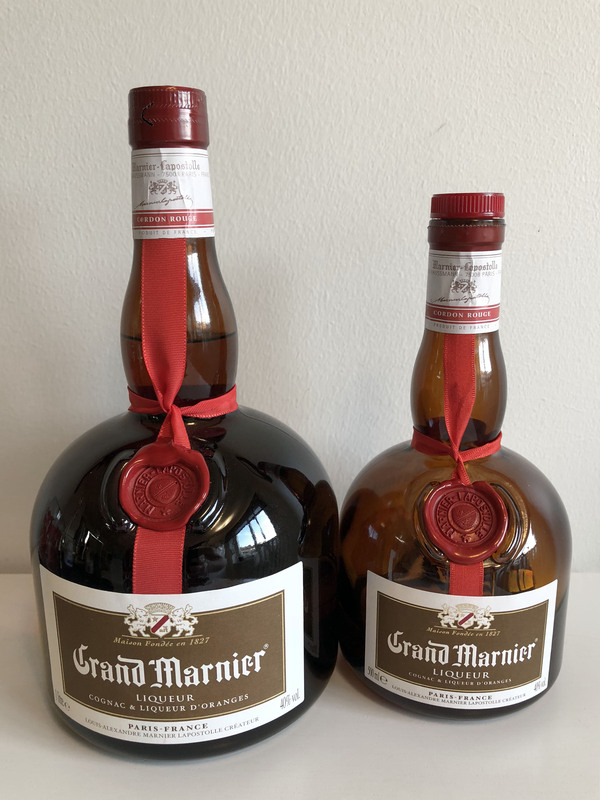 You can use the peel to flavour liqueurs such as Triple Sec, Curacao (where a special subspecies of the Seville orange is grown for precisely this purpose) and my personal favourite, Grand Marnier. The peel is used to flavour gingerbread and other desserts throughout the Nordic region. 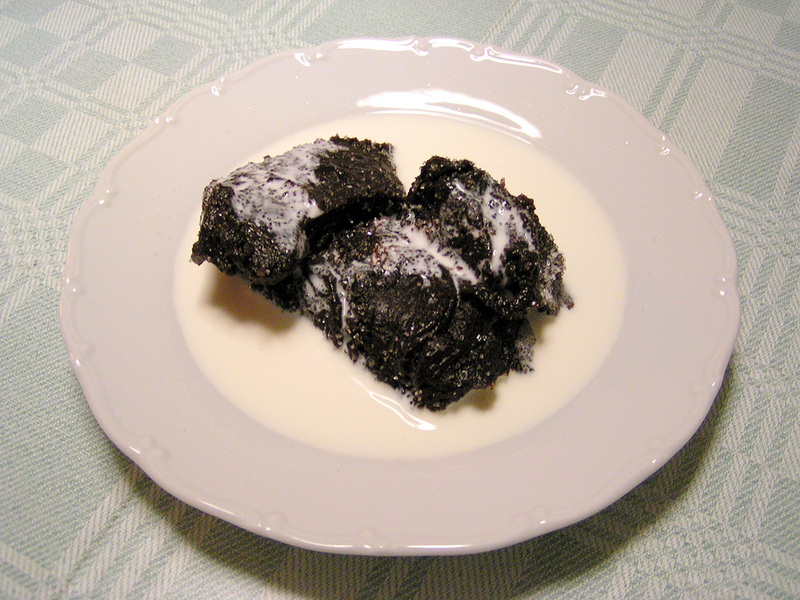 A Finnish Easter dish called Mammi looks particularly enticing. 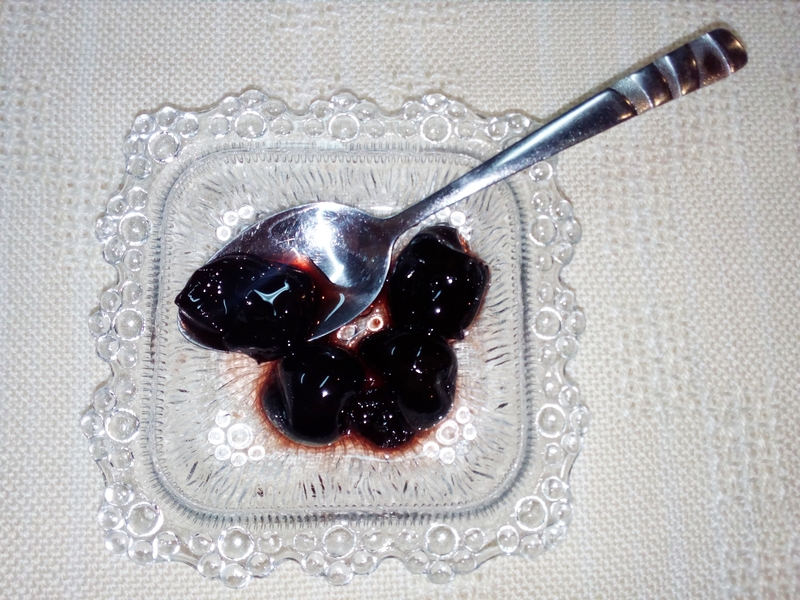 In Greece, Cyprus and Albania the fruit is an important component of spoon sweets – tasty preserves which are served on a spoon, usually with a strong Greek or Albanian coffee and sometimes cheese. Seville oranges are used extensively as a side dish for charred meat and fish dishes in Iraqi and Iranian cuisine , and is also used as a salad dressing. I watched an episode of the Netflix cookery series ‘Salt, Fat, Acid, Heat’, in which the chef Samrin Nosrat travelled to the Yucatan peninsula in Mexico. Seville oranges are used extensively in the cuisine here in preference to other sources of sour flavours (such as vinegar). 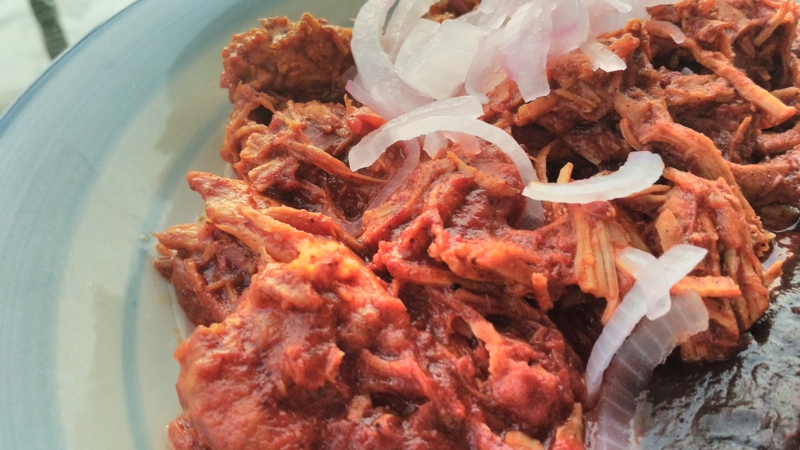 In particular it is used in the pork dish Cochinita pibil, in which the meat is marinated in the bitter orange juice, seasoned with annatto (an orange-red condiment) and then roasted in a banana leaf. After all that food you might be glad to hear that essence of bitter orange has been marketed as a dietary aid and appetite suppressant, but hold your horses – some of the chemicals in the fruit act to raise heart rate and blood pressure, which is not desirable if you have circulatory problems of any kind. The supplements have been linked to stroke, angina and ischaemic colitis. Best to just lay off the marmalade, I think. 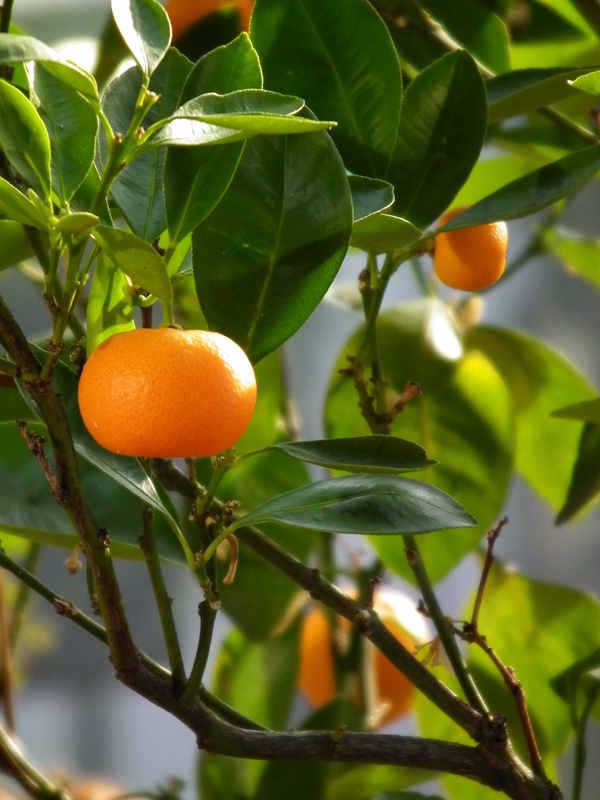 The Seville orange tree has also been used as a rootstock to grow the sweeter varieties, to make soap and as the material for Cuban baseball bats. The essential oil is also widely used in toiletries and perfumery. 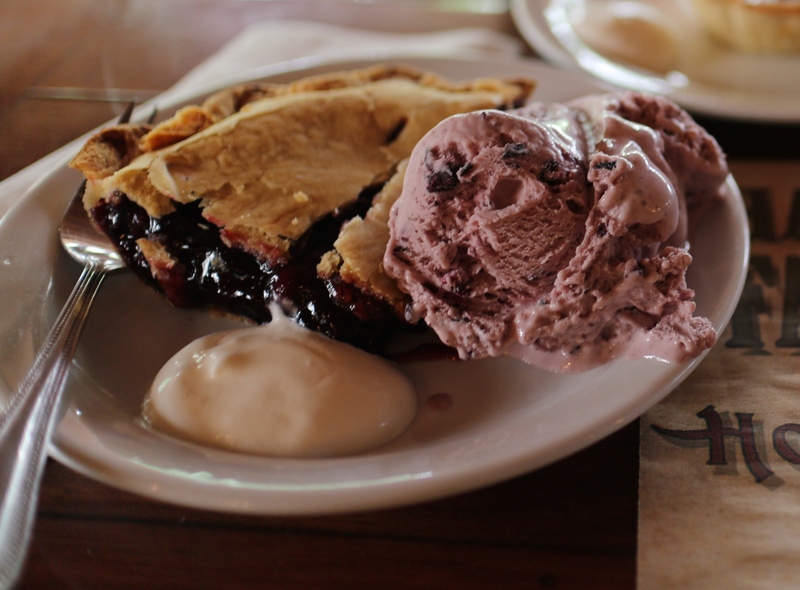 And now I find myself getting quite hungry. The only thing to do is, of course, to head downstairs for some toast and marmalade. But here is a poem that sums up the communal nature of marmalade making in many villages and towns all over the world. 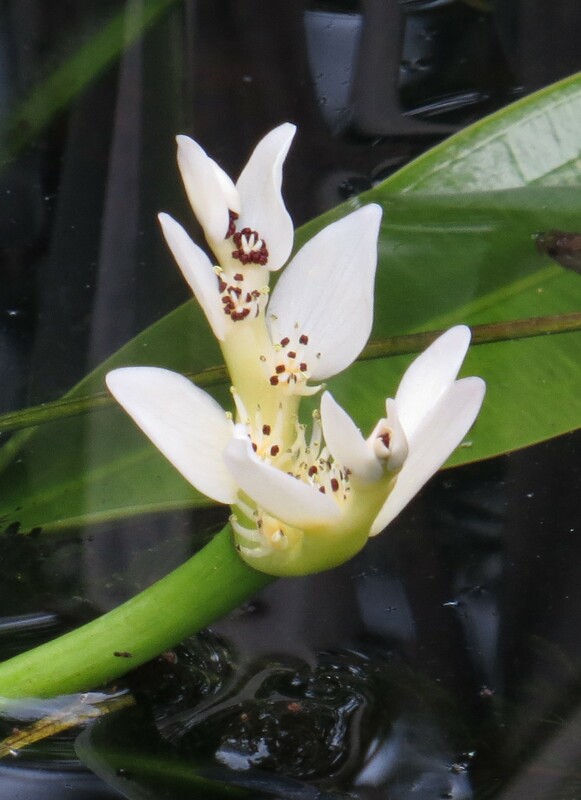 This entry was posted in London Plants on March 27, 2019 by Bug Woman.